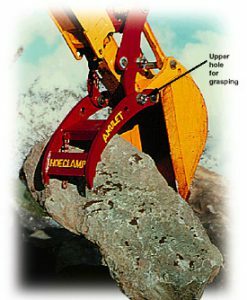 The Amulet HoeClamp is a pin-on, full motion thumb that fits most standard and extendable stick backhoes up to 30,000lbs. 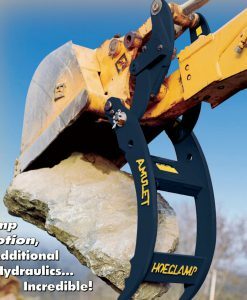 No hydraulics are required to operate The HoeClamp on your backhoe excavator. Expand your backhoe with the ability to grasp, and dig without hydraulics. Best pin-on mechanical thumb for construction, rock handling, land clearing, demolition and excavation projects. Best price and lowest shipping possible! For more information call EQUIPMENTLAND.com today.